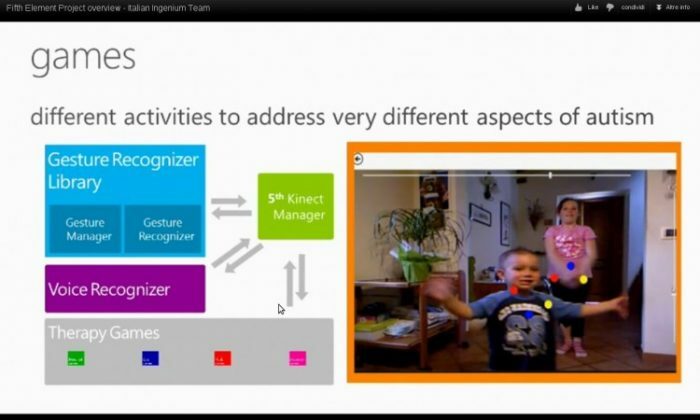 The ambitious Fifth Element project aims to support the more than 60 million people who suffer from autism by using none other than the Microsoft Kinect, originally designed for video games on the Xbox 360. The Fifth Element project is being led by Italian Ingenium, a four-man team with a passion for technology. Their project is already being used in rehabilitation centers, and is poised to spread across the globe in the next several months. Kinect is a player-recognition system. Resembling a large webcam, the Kinect is placed on top of a television set and detects a player’s movements, which can then be used as commands for a video game. Yet, thanks to Web-based remote assistance services, even those who cannot physically access a rehabilitation center can learn and undergo therapy using Kinect. “It’s a simple idea, and we can immediately see its potential impact on people,” said Matteo Valoriani, a 26-year-old student at Politecnico di Milano (Polytechnic University of Milan), and a creator of the Fifth Element project. Matteo came up with the idea in December 2011 during a friendly chat with a friend who works in physical therapy. The friend told him how difficult it was for rehabilitation centers to meet with autistic children in need. Specialized technology for similar purposes is very expensive. Yet, with Fifth Element, all that’s needed is a television, an Xbox 360, and a Kinect. The program itself is also simple, creating an interactive platform with standard images, voice, and text. Each game and activity is developed with a specific therapy in mind. Every game can be directly customized by the therapist to use different features and different levels of difficulty. The therapist can also change settings for the game remotely while interacting with the child over the Internet and from anywhere in the world. After a session is completed, it can be saved so that parents can reuse it with their child on their own time. “We are working to allow the child to see the therapist on screen real time, and they can interact on the screen thanks to the Kinect,” said Valoriani. The Fifth Element project won the July Health Awareness Award during the Microsoft Imagine Cup 2012, out of 350 students from more than 200 countries. Willing the first prize at the competition in Australia helped the team get global attention for the new concept. The game creates virtual characters that children can recognize as their digital avatars, and they can use the avatars to develop relationships with other children. “In some cases, it happens that the child teaches another child how to play,” said Valoriani, who is noticeably pleased with the results. While the system is built to allow interaction regardless of distance, it can also be used by two children in the same room, or at a rehabilitation center under the supervision of the therapist. Parents also have a level of control. They can update the statistics on the child’s progress, which the therapist can use as notes for the next treatment. The data is saved for other doctors who may do therapy for the child. At the center of Benedetta d’Intino of Milan and the association Astrolabio, doctors have welcomed the experiments and have helped refine the system through feedback. Much of this refinement is used to improve interactive activities and to quickly develop new games. The system’s custom platform, Azure, gets better every week, and its uses are already being considered for uses in other fields—including in education. Valoriani says the name, Fifth Element, is based on the ancient theory of the five elements that constitute the world.